We’re glad you’re here. Whether you’re a current WSU student or considering attending WSU, you’ll find the information you need to get started using the services provided by Access Services. A disability is defined according to state and federal legislation as a physical or mental impairment that substantially limits one or more major life activities. These activities include the ability to write, learn, read, think, memorize, hear, see, talk or walk. While some disabilities are apparent or “visible”, most of the students who receive services from Access Services have hidden or “invisible” disabilities. An academic accommodation is a modification that is made to a course, program, job, activity or facility that eliminates or minimizes disability-related barriers to allow for equal access. • It must not compromise essential requirements of a course or program. • It must not cause an undue administrative or financial hardship. • It must not compromise safety to you or others. • It must not fundamentally alter a course or program. Common accommodations offered at WSU are extended time on exams, quiet, low distraction test location, exams in auditory format, texts in alternate format, disability advising, sign language interpreters, note-taking technology, scribes and accessible classrooms and labs. Who is eligible to use Access Services? Any enrolled Winona State University student with a permanent documented disability is eligible to use the accommodations provided by Access Services. Examples include, but are not limited to learning disabilities, ADHD, depression, anxiety, loss of mobility, hearing loss, and low vision. Students with a temporary condition such as a broken leg, hospitalization, pregnancy, or extended illness may find these resources helpful. When should I register with Access Services? You can register anytime throughout the year with Access Services after you’ve been accepted to WSU by submitting your application and documentation. If you are a new student attending New Student Registration in June, you should submit your paperwork by April 11 for consideration of priority registration. To have your accommodations in place for the start of a new semester, you should register with Access Services by July 25 for the fall semester, or by December 15 for the spring semester. An IEP is acceptable if it includes full psycho-educational testing and results. These local resources may be helpful in being diagnosed with a learning disability or ADHD. Where will I receive my testing accommodations? Your professors may choose to provide accommodations for your exams in a quiet area near the classroom or in their department. They may also prefer that you take your exams in the Access Services office in Maxwell 314. WSU-Rochester students will use a quiet room on the 3rd floor of the library to take exams with accommodations provided by Access Services staff. Section 504 of the Rehabilitation Act of 1973 states "No otherwise qualified handicapped individual in the United States...shall, solely by reason of their handicap, be excluded from participation in, be denied the benefits of, or be subjected to discrimination under any program or activity receiving Federal financial assistance." To receive necessary reasonable accommodations and support services to allow equal access to Winona State University. 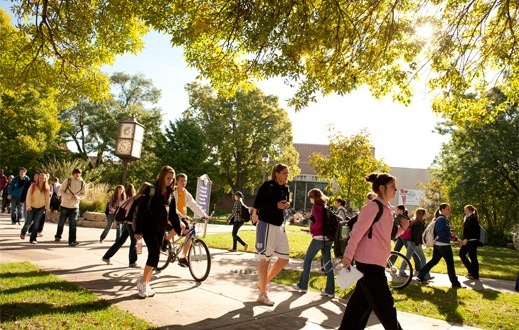 To participate in, and benefit from courses, programs, services and activities offered through WSU. To be treated by faculty and staff with dignity and respect. To have discussions of their disability kept in confidence until permission of disclosure is given. To report a grievance to Access Services if they feel that their disability related needs are not being met. To identify themselves as an individual with a disability when seeking an accommodation. To provide current documentation from an appropriate professional source that verifies the nature of the disability, functional limitations, and the need for specific accommodations. To follow specific procedures for obtaining reasonable and appropriate accommodations including initiating certain services each semester in a timely manner. To meet the University’s qualifications including essential technical, academic, and institutional standards. Determine your classes’ requirements and possible needed accommodations. Request Accommodation as far in advance as possible. To follow the University’s Academic and Conduct Standards as required of all students on campus. Notify Access Services of any schedule changes after initial registration if they affect your accommodations. Download “Rights & Responsibilities of Students with Disabilities"